You might not be aware that ghost ships have existed for centuries. Some ghost ships supposed to be crewed by the dead, while some ghost ships are real ships that have disappeared or sunk tragically. Full Moons associated with temporal insanity. Comment Artwork SHOW This artwork image has 43 comments. How do you download pics on this site??? Really awesome picture. Also, I noticed that your artwork is awesome enough to be featured on one of the album covers of The Fall of Troy's albums. Dreamy.... Makes you feel as if you are there. Your artwork is spectacular,amazing. And the feeling of the pictures are fantastic. Thank you for the delivering... of moods. Just as great at Final Frontier... (My bad english can't express my feelings.) This is art!! Excelente obra??? no alcanzan las palabras!!! Muy atrapante! Muy bueno! Not just a picture, but a mood, a feeling, a dream. Incredible! Captivating...I drew something similar when I was younger...A fascinating theme and this artist has a nice touch. Theses shouldn't be known as pictures only, but really amazing artworks! All of his artwork is amazing. I really love the Ghost Ship series. The way the Ocean/waves are rendered are brilliant! This is hauntingly beautiful - no pun intended! Completely, absolutely gorgeous and breathtaking work! Excelent quality art, much respect to the artist!!! Phenomenal work of art! Love the way the textures blend in with the ghostly scenery and the attention to details is amazing! This is an incredible piece of art- hauntingly beautiful. It draws you in and captures the imagination with its compelling yet subtle splendour. Simply wonderful. Yeah yeah! thnx that's my boat m driving it . yeah its a boat u haven't seen the ship arghhhhhhhhhhhhhhhhhhhhhh! Eine wunderbare Arbeit ! Eines meiner Lieblingsbilder ! Mehr bitte! I am an artist as well, and I am an instant fan. I love your work. It takes me to a place of endless possibilities, where nothing is unreachable. Thank you. What I find so capturing about this piece is the effect of dragging you into it. I love your effect of the whispy clouds circling the large moon. Congratulations on a positive overwelming feeling. I stumbled upon this site when searching for fantasy desktop backgrounds and I love this. The waves are so realistic and everything about this piece is pure beauty. I have admired your work ever since I first laid eyes on it a couples years ago. It has strikes a sad, yet beautiful chord within me. Please, make more. The Work is unbelieveably detailed and beautiful. I love it. Omg what beautiful work! What a talent, what work.... amazing! HI, This is one of the best 3d sites i have seen. The wallpapers are simply the best and mind blowing. A friend turned me on to your work yesterday,,I am so in awe,,your work is awsom. I would never compare my work to yours,but I am into art and got into bryce about 7 years ago. Your texture is unreal,,your plant placement? How do you do that? Tengo que decir que estoy increiblemente impresionado con su obra. This is awesome. It's amazing how photographic your work is, but yet so far far from reality that it couldn't possibly be real. 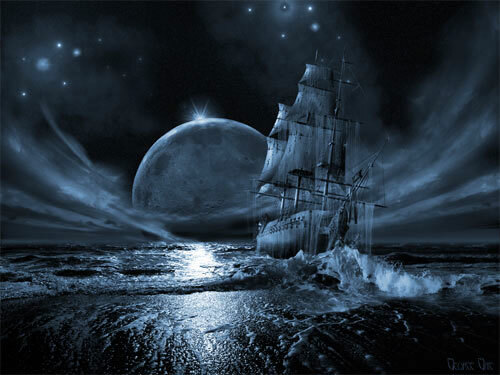 Ghost ship series: Full moon rising, 3D Digital Art, Fantasy Art - desktop wallpaper.